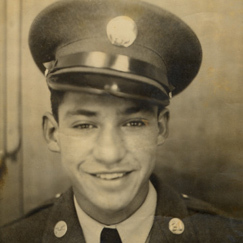 Medal of Honor nominee Michael C. Pena was born in Newgulf, Texas, November 1924. He joined the U. S. Army as an infantryman in 1941, when he was 16-years-old. He fought in both World War II and the Korean War. Pena is being recognized for his actions on the evening of Sept. 4, 1950, near Waegwan, Korea, when his unit was fiercely attacked. During the course of the counter-attack, Pena realized that their ammunition was running out, and ordered his unit to retreat. Pena then manned a machine-gun to cover their withdrawal. He single-handedly held back the enemy until morning when his position was overrun, and he was killed. In addition to the Medal of Honor, Pena received the Distinguished service Cross (this award will be upgraded to the Medal of Honor on Mar. 18), Bronze Star Medal, Purple Heart with one Bronze Oak Leaf Cluster, Army Good Conduct Medal with Bronze Clasp and two Loops, American Campaign Medal, Asiatic-Pacific Campaign Medal with four Bronze Service Stars and Bronze Arrowhead Device, World War II Victory Medal, Army of Occupation Medal with Japan Clasp, National Defense Service Medal, Korean Service Medal with one Bronze Service Star, Presidential Unit Citation, Combat Infantryman Badge (2nd Award), Honorable Service Lapel Button- World War II, Philippine Liberation Ribbon, Philippine Independence Ribbon, United Nations Service Medal, Republic of Korea-Korean War Service Medal, Philippine Presidential Unit Citation, Republic of Korea Presidential Unit Citation, Gold Bravery Medal of Greece Unit Citation. The President of the United States of America, under the provisions of the Act of Congress approved, July 9, 1918, takes pride in presenting the Distinguished Service Cross (Posthumously) to Master Sgt. Mike C. Pena, United States Army, for extraordinary heroism in connection with military operations against an armed enemy of the United Nations, while serving with Company F, 2nd Battalion, 5th Cavalry Regiment (Infantry), 1st Cavalry Division. Pena distinguished himself by extraordinary heroism in action against enemy aggressor forces in the vicinity of Waegwan, Korea, Sept. 4, 1950. On that date, at approximately 11 p.m., an enemy battalion moved up to within a few yards of Pena’s platoon, under cover of darkness and an obscuring mist. Observing the enemy, Pena and his men immediately opened fire, but the sudden, point-blank fire of the hostile forces made it necessary for the friendly troops to withdraw. Rapidly reorganizing his men, Pena led them in a counter-attack, regained the lost positions, and attempted to hold back the enemy. Despite the devastating fire laid down by the friendly troops, the enemy continued to hurl themselves at the defenses in overwhelming numbers. Realizing that a scarcity of ammunition would soon make the positions untenable, Pena ordered his men to fall back, manning a machine-gun to cover their withdrawal. Single-handedly, he held back the enemy until the early hours of the following morning when his position was overrun, and he was killed. Pena is set to receive the Medal of Honor posthumously in a ceremony at the White House on March 18.